E-mail is not only a communication tool that is used to reach out to consumers, but also as a means for consumers to begin a conversation with your organization – each method, though, presents an opportunity to deliver a marketing message and influence the user experience. There are guidelines (i.e. CAN-SPAM) that look to limit the exposure of consumers to marketing messages or unwanted e-mail communications. However, a sound marketer can use e-mail to extend the relationship with prospects and customers whether it’s through marketing communications, transactional alerts, or public relations. An outbound e-mail marketing program entails not only the scheduling, messaging, creative development, transmission, and reporting on open rates. You have to make some “game changing” decisions at each step along the path (e.g. do you purchase an e-mail technology service or outsource to an e-mail marketing agency?) that can greatly affect the personnel and monetary costs. The scale opportunity comes from a single source transmission provider like SilverPop, CheetahMail, ExactTarget, and EmailLabs. This is especially true if you are a large multi-department/brand organization where you can realize per transmission savings going out a single entity. Other scale chances come from the performance monitoring through web analytics or competitive intelligence tools like Email Data Source. E-mail received by your organization is often controlled by IT, but there are software solutions like RightNow Technologies that can help you manage inbound e-mail. However, these types of solutions don’t handle the entire job around the timeliness of responding or presenting an accurate marketing message. Brick and Mortar Extension is the act of driving customers to a physical location to purchase product or service. Many people have challenged me that this isn’t eCommerce. Although I agree that BME isn’t true eCommerce, I have clients that can’t do the other two methods listed below based upon their business models (i.e. large items that don’t work well for DTC or Brick-and-mortar only businesses like restaurants or auto mechanics). BME allows for a level of eCommerce classification for this type of client. BME traditionally manifests itself through technology solutions such as store locators that use ZIP codes to identify the closest store or through promotions used to drive foot traffic like coupons or gift certificates. Pure Play is driving customers to another online location to purchase the product or service. This could either be another vendor or to a company-run storefront through the likes of eBay, Yahoo, or Amazon. Pure Play clients tend to be small to medium sized businesses that don’t have the desire or internal resources to process the orders. Also, there are large expenses involved in building a DTC-enabled website and organization. Pure Play allows for a faster time-to-market at lower cost. DTC is directly selling the products or services through your website. From a scaling perspective within a company, DTC is a very complex endeavor. You must have plans around Merchandising, Marketing, Fulfillment, and Operations/Financials. I have seen many companies go under by ignoring one or more of those items. As stated earlier, the tactics that are driving prospects and customers into the Engagement Entry Points have attributes that can require differing levels of involvement, decision making processes, or approaches if you are trying to scale the tactic internally or with external vendors. Next few articles are a tactic-by-tactic breakdown explaining the points of concern. I am starting with Affiliate Marketing. Affiliate Marketing is the practice of rewarding other websites for sending traffic to your site. Usually, the reward is tied directly to that visitor completing an action whether it is purchasing product or registering for a webinar. With affiliate marketing, the effort the organization mainly has to realize is around the acquiring and maintaining of relationships with the affiliates. And this is where the determining the level involvement for the organization comes into play. By taking the responsibility of managing affiliates with in-house resources, it requires that personnel own the identification, recruiting, and managing the affiliates. This includes ensuring the affiliates are compensated and monitored for performance. Third party affiliate marketing covers the user of affiliate networks such as Commission Junction and LinkShare, affiliate management companies such Performics and PepperJam, or through specific large niche players like eBay and Amazon. Whether you are in charge of marketing a specific product or brand or your entire organization, digital marketing has become so much more than building and managing a website. When I started building websites in 1994, there was no such thing natural search optimization, paid search, mobile web, or social media (we just called them “forums”). Most digital marketing was purely an extension of traditional media; and “integrated marketing” meant making sure your website had the same look and feel as your print ad. The rapid growth and evolution of digital marketing has caused tactical segmentation that is starting to cause more headaches for a marketer than it probably should. I was speaking with a digital brand manager for a large CPG firm. For her annual programs, she has needed to manage eleven tactic vendors – not including her Interactive Agency of Record or Public Relations Agency. If you want a job that is nothing but answering e-mail and voicemail and processing vendor invoices, then that’s the job for you. One of the biggest problems with disparate vendors is you can end up having to fight to make sure that your message is consistent and clear, all the while fending off the vendors who want more money to execute their “most important” tactic. One way I help clients understand the complexities is through the Capabilities Map (or affectionately, the “Flower Bed”). Each dot or “pistil” represents a digital marketing tactic that requires some level of management. The lines or “petals” coming out of each dot are either strategies or types of sub-tactics that requirement some level of consideration. Some petals require simple yes/no decisions (e.g. are you going to have a blog or not?) while others may require different strategies altogether (e.g. inbound and outbound e-mails often need different technology and governance). 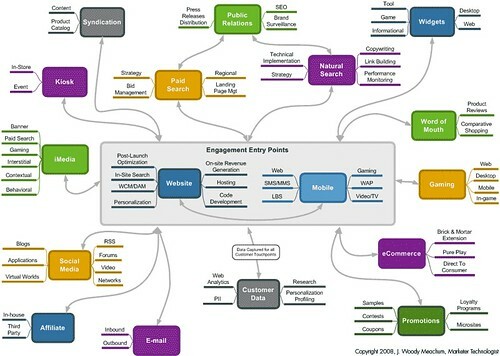 At the center of Capabilities Map are Engagement Entry Points or EPPs. EPPs are the control points for capturing Personally Identifiable Information (PII). Websites and Mobile have emerged as the leading digital EPPs. However, avenues such as the multiple Interactive Television models are showing promise. EPPs can also be offline such as driving customers to a Brick and Mortar store or live event. Customer Data won’t be address here – that’s another article. Google look over here! We’ve got analytics too! Following the purchase on IndexTools in April 2008, Yahoo has launched a beta of Yahoo! Web Analytics. This puts Yahoo! on par with Google from an solid analytics provider standpoint. I always liked IndexTools as a lower cost Web Analytics solution and if Yahoo! can keep the integrity of that platform while providing another no cost alternative to customers — bring it on. The ability to track more than 4 scenarios (or goals to my Google Analytics brethren) would be enough to make me take a serious look. There are discussions about whether the tool will be be free or not. My hunch is that it will be free as long as you are part of one Yahoo!’s advertising solutions. This is fair in my opinion. The system is still in beta with current customers through early 2009. Your Ads be damned. I’ll show what I want. This type of approach has been around for a few years. I recall a similar bent with the Comedy Central “I Poop on Your Site” starring Triumph the Insult Comic dog. However, this approach to effect advertising on a localized basis is interesting. Since it’s client-side, will the ad servers be able to pick it up? Probably not, but if you know, please post a comment. Also, I’d love to know the adoption rate of this–however small. Sounds more like an attempt as a “buzz generator” that anything else. However, more of a buzz with advertisers than with the consumer. Which candidate for president? Their website could sway you. I like how Corey took a technology approach to what some might perceive as only a marketing opportunity (even though done in jest). Earlier this year, I had a client who was trying to determine which was the most important of their nine personas (too many IMHO). Senior management thought it was one, Sales thought it was another, Marketing wanted another, and so on and so on. They also wanted to know what they should budget for marketing to reach these personas. I use to the run the website and do online marketing for a Homeland Security magazine. Through an article, I became aware of a program run by the United States Food and Drug Administration to help farmers determine if their farms were targets for terrorism. The program is based upon a military practice called CARVER that is used to identify and prioritize targets. After doing some quick online research, I came upon the Joint Special Operations Targeting and Mission Planning Procedure from the Joint Chiefs of Staff. I began to modify the strategy that the Special Forces uses into a method that marketers can use to make better decisions around whom they should target and the best means to reach those targets. Through some pretty in-depth research, I haven’t found anyone else who’s doing this, so, it’s the birth of CARVER Marketing. I used CARVER Marketing to help the client I mentioned earlier rank their personas and provided the back-up data that was socialized throughout the organization to get everyone on the same page. So while personas are often used as a conflict resolution device, CARVER Marketing can provide additional support to keep programs moving along. CARVER Marketing can remove some of the guesswork and “gut instinct” that litters a lot of marketing which is causing longer timelines and costing more money. Start from an educated position then “fire and adjust”. I have written a white paper on applying CARVER Marketing to digital marketing tactics. I use this method to help figure out budgeting for marketing campaigns. If you would like a copy, send me a note. CARVER Marketing for Personas is coming along, you should see it in a few weeks. How to identify and prioritize your personas and digital marketing tactics before firing your first marketing salvo.